After graduating from college, you have lots of options. 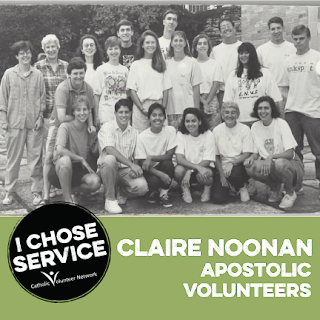 This series highlights people who chose service, and how the volunteer experience has made an impact on their lives. How did you first learn about post-graduate service? Through my college campus ministers as well as students who graduated ahead of me. What other options were available to you, and why did you decide on Apostolic Volunteers? I looked at several programs in the RESPONSE catalog and chose the program I did because of the speed of their placement process and the personal connections I had to the sponsoring religious community. Share about your service experience. The most important part of my experience was the community life I shared with the Sinsinawa Dominican sisters. These women taught me the deep and fundamental spiritual wisdom and truth—I am loved, not for what I do but for that I am. What benefits have you gained from this experience that you might not have received otherwise? Honestly, I have participation in this program to thank for almost every important part of my life today—my husband is also a alum of the program, and my ministry/job today is with another sponsored institution of the religious community that sponsored by program. Also, I met many, many of my closest friends through the program and others like it. What advice do you have for someone considering post-graduate service? Do it!! And put your whole self into it. It will be difficult, but worth it.